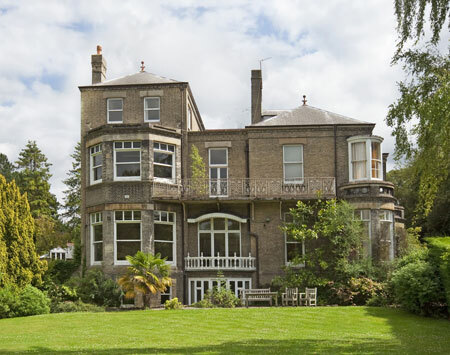 The University of Cambridge is selling a substantial Victorian property in a location which is regarded as one of the best in the city of Cambridge. 6 & 6A Chaucer Road is situated just off Trumpington Road, in gardens and grounds of 1.2 acres close to the University of Cambridge Botanic Garden and backing on to Vicar’s Brook and Coe Fen leading down to the River Cam. Originally known as ‘Birnam House’, it was one of the first significant houses to be developed by the Pemberton family, typically for wealthy College dons, as part of the promotion of the Chaucer Road/Latham Road Estate as an area of distinguished character. Over the last three decades, the property has been used by the University of Cambridge’s Department of Architecture for the Martin Centre – as well as for its gardener’s site. The story of the property’s variety of residential, educational and horticultural use is told through the features of the buildings as well as the in the grounds, according to sales agents Carter Jonas. Retained features in the main residence include a grand reception hall and staircase with stained glass windows, glazed lantern and ornate plaster ceilings and cornices. Ceilings are approximately 12 ft with sash windows almost to the full height in many rooms. One of the garden areas features a number of specimen trees enclosing lawns to the west of the building. A separate area adjacent to Coe Fen is screened from the formal garden that was previously used as a nursery garden area. The cottage also includes its own private garden to the rear. While none of the buildings of 6 & 6a Chaucer Road are listed, they are within a conservation area and the main residence is recorded as a building of local interest. Existing planning permission includes use as non-residential institutions such as educational and health services establishments. The vendors have submitted a planning application for change of use of the house to a single dwelling house and flat which would, if pursued and approved, bring the home back to its original residential use. As Mark Hallam, a partner of Carter Jonas in Cambridge (01223 368771) who is handling the instruction, points out, 6 & 6a Chaucer Road tells a story typical of its style and of the passage of time. ‘The property has had a variety of uses including residential and educational yet has still retained many appealing features, typical of its age and character. ‘Its occupants down the years have shown the kind of respect, and appreciation of a very fine, very Cambridge property.